Disclosure: I was provided with a screener from the vendor in exchange for an honest review. All views shared are mine and mine alone. Kevin Sorbo and Patrick Muldoon star in the family adventure BERNIE THE DOLPHIN, coming to select theaters and On Demand on Today (December 7), from Lionsgate. Instead of doing school work today, we enjoyed a "Funday Friday" filled with baking holiday cookies, making Christmas crafts and decorations, finishing up our greeting cards to mail out, and then finished with a fun family-friendly movie, Bernie the Dolphin, from Lionsgate. This movie is new today and available to view On Demand and select theaters. "Kevin and Holly love splashing and playing with their dolphin friend Bernie and his family. But when Bernie goes missing, the kids go looking for him. While searching, they discover a real-estate development plan that threatens the baby sea turtles on their favorite beach. Can the brave duo stop the developers while racing to reunite Bernie with his loved ones? This sunny family adventure stars Kevin Sorbo (TV’s “Hercules: The Legendary Journeys”) and Patrick Muldoon (Starship Troopers)." As you can tell from this trailer, the film features Kevin Surbo, who also acts as executive director of this wholesome film. My girls love marine animals and have been fans of other marine-themed movies, so I knew they would love Bernie the Dolphin. After we popped some popcorn, we settled in to watch this movie, which has a run time of 92 minutes, and rated G.
The story follows two siblings, Kevin and Holly, work together on a dolphin documentary. This film does a great job in introducing and informating young viewers about marine life, with its ecological message. As a homeschool mom I love films like this that are not only fun to watch, but have a positive message behind it, and can open doors for discussion afterward. 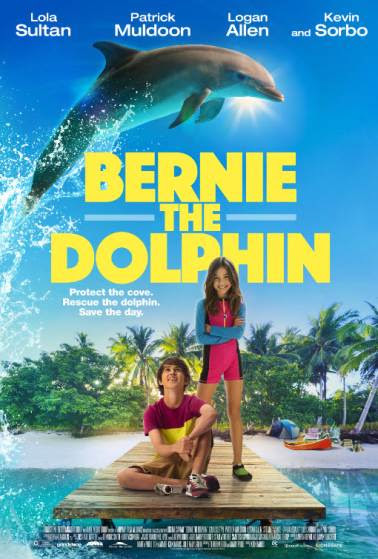 Bernie comes into the picture after Holly is in a boating accident, and is rescued by the dolphin. But, then Bernie disappears and the siblings work together to look for their missing friend. During their search they stumble upon a nearby island that is to be turned into a real estate development. But, if this happens, then the development will damage the ecosystem and ruin the sea animals' habitat. Not only do Holly and Kevin want to find Bernie safely, but they also want to help protect this island. This is where the real story happens, and will keep family's engaged right up until the end. You will find yourself rooting for the kids to find a way to protect the island, and find Bernie safe and sound. So, are they successful? You will just have to watch this new release to find out for yourself. What I will say is that we enjoyed this movie thoroughly, and the girls fell in love with Bernie the moment they saw this dolphin appear in the film. 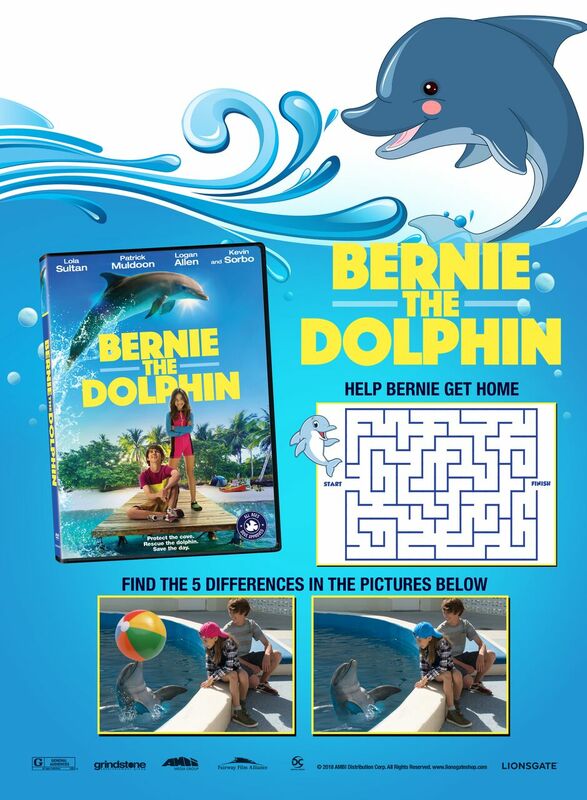 If you are looking for the perfect family-friendly movie to enjoy with your family tonight or over the weekend, why not purchase Bernie the Dolphin, from On Demand, or find a theater near you where this wholesome film is playing. You will love it! Right click on photo above and print and enjoy!